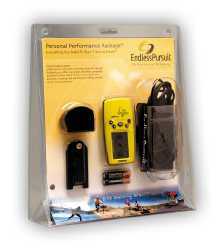 ENDLESS PURSUIT OFFERS FREE GARMIN GPS UNIT AND ACCESSORIES! Endless Pursuit is introducing, for a limited time only, a FREE Garmin Gecko 201, Bike mount, armband and pc interface cable to everyone who purchases their lifetime subscription Performance Pass access for $299. "Our totally unique web based product provides an athlete, whether a weekend warrior or elite professional, with the most complete, and objective analysis of their workout currently available anywhere. We are so sure athletes at all levels will realize tremendous training benefits from Endless Pursuit, we are willing to give away the GPS units and accessories for FREE!" says K.C. Bryan, Vice President of Endless Pursuit. By harnessing the power and accuracy of GPS technology, Endless Pursuit is able to track outdoor activities and workouts, chart performance -- including power output (watts) and calories burned, map routes using satellite images and topographical maps, provide elevation profiles and more. With a few mouse clicks on a PC, www.endlesspursuit.com then crunches the numbers collected by the GPS during your workout, turning raw data into 50 different performance metrics, 25 useful charts and topographical map and aerial photo overlays of routes. Endless Pursuit's power is derived from the unique ability to record, quantify and analyze GPS data over time in a richly meaningful graphic environment, providing users with distinct advantages over those who rely on a less scientific means of recording and viewing training data. And because it's completely portable through the use of a handheld GPS device, one unit can be used to track all outdoor activities. Endless Pursuit is the most powerful, effective tool available for tracking elevation, calories, power output (watts), speed, distance and more, and for comparing workouts and tracking progress over time. Unless an athlete trains with a professional coach, no other system provides such an extensive array of performance analysis, feedback, and the ability to objectively track and compare progress. If you currently own a GPS, sign up for our NEW subscription service  try it for a month for under $17.00! at www.EndlessPursuit.com. If you don't own a GPS -- Check out our Personal Performance Package that includes a lifetime subscription to our products. Buy the software for $299.00 and we will give you a Garmin GPS, hardware and everything else you need to get going for FREE! INTRODUCING ENDLESS PURSUIT, THE MOST COMPREHENSIVE TRAINING TOOL AVAILABLE!